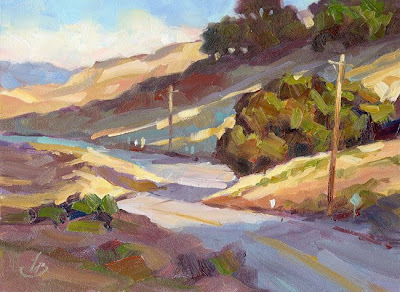 On my blog I usually show small plein air paintings, but I work in all sizes and often create larger paintings on commission like the one shown below. Please email me if you are interested in having me create something special for your walls: tombrownstudio@cox.net. What keeps collectors coming back for more of your paintings. The special offer price is $50, with free shipping to anywhere in the USA. This special “PAINTING BIG” PACKAGE also makes a unique Holiday gift for your artist friends! To order, email me at: tombrownstudio@cox.net. That 6x8 is a beauty! Such flow and it looks BIG!